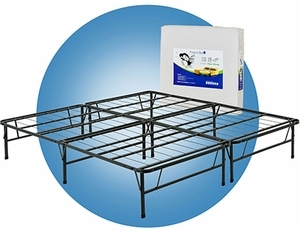 Pragma�s Simple Base bed frame features a new mattress-support system that eliminates the need of a box spring. The sturdy, fabricated steel frame and wire-mesh platform does not bend of sag over time. Pragma�s Simple Base bed frame accommodates all mattresses, including therapeutic memory foam, conventional innerspring, air, or latex mattress for a firm, squeak-free sleeping experience. Pragma�s Simple Base features a lightweight, foldable design, offering easy transportation and storage. You may choose between our BI-FOLD (folds once in half) and QUAD-FOLD(folds twice into quarters). Dimensions for each option are listed in the �Specifications� section. All frames, except Twin and Twin XL, feature two separate frames that are easily joined with connecting bolts for the desired bed size. � Sets up in less than 5 minutes; no tools required. � Twin/Twin XL/Full frames hold 1300 lbs. ; Queen/King/Cal. King frames hold 2400 lbs. � Bedbug and dust mite resistant; hypoallergenic. � Comes with 3-year manufacturer�s warranty; excellent customer service and return policy.